Unless stated otherwise all tournament spins given for tournaments are subject to the same terms and conditions as for free spins as stated in the general bonus policy. Freeroll tournament spins payouts will not be credited to a player’s balance. The sole purpose of the payout is to determine a player’s rank in the leaderboard. Tournaments run until the countdown within the relevant tournament page reaches zero (0). The time at which a player finishes his/her tournament spins will determine for which tournament his/her tournament spins results will be associated. If a player starts his/her tournament spins immediately before the active tournament ends but his/her tournament spins finish only after the tournament is over and his/her payout result is known only after the tournament is over, there is no guarantee that the result of the player’s tournament spins wins will be added to the leaderboard for that completed tournament. All tournament spins payouts are converted to points for the leaderboard. The type of currency a player uses does not affect the number of points awarded. Therefore, all players - regardless of currencies - are considered equal. The number of points earned in the tournament determines a player’s ranking within the leaderboard. In the case of a tie, the player who reached the winning amount first will be considered the winner over the second player who reached the same wining amount after. Buy-in tournaments have a minimum deposit requirement. Deposits made below will not trigger the tournament spins. Buy-in tournaments allow for re-buys. This means that players can participate in the same tournament multiple times. Re-buys provide another chance to improve your points result and leaderboard position. Points earned from re-buys will not contribute towards a previous score, but will act as a new points score. Your top points score will determine your leaderboard position. Players who claim tournament spins are to abide by the fair play rule stated in the general bonus policy. Simply claiming tournament spins with the sole purpose of just playing the spins to gain winnings will result in potential winnings to be removed and disqualification from the tournament. Players who have bonuses disabled are not permitted to take part in any tournaments. Tournament spins are given to participants to be used specifically for the allotted tournament. Tournament spins will expire after one (1) day. Prizes will automatically be given to the winning player after a tournament has finished. All prizes are final and cannot be exchanged. Prizes from freeroll tournaments are considered to be free bonuses and are subject to the general bonus policy. 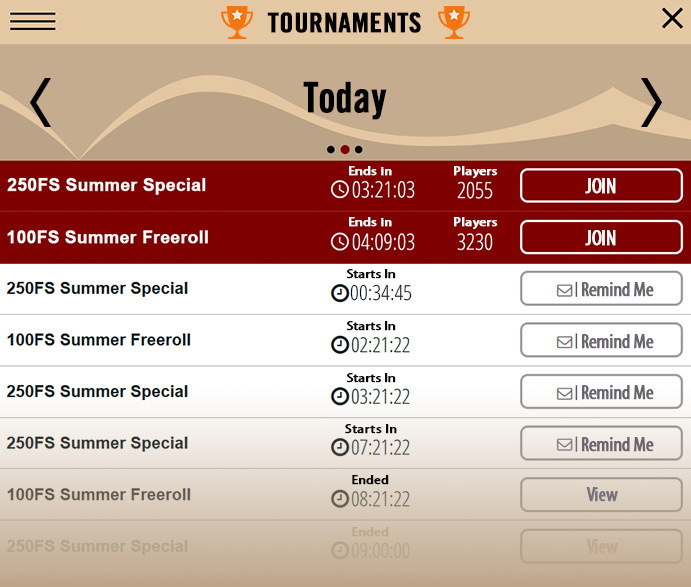 Only players who have made a deposit in the last 3 days can take part in freeroll tournaments. All calculations made by the system are final and will not be subject to any dispute. All tournaments are subject to change at any time. The operator reserves the right to change or cancel any tournaments without prior notice.